Galavant was one of those shows that came on TV and everyone I know told me I needed to watch it. Unfortunately for both me (and the show if I represent its target audience) I’m not the kind of person to watch programmed TV. I’m in the streaming video generation. Luckily for people like me, the show is now on Netflix and even though it represents essentially everything I don’t like in a show…I can honestly say it’s one of the best new IPs I’ve seen in years. It’s a Musical: I’ll just say it: I don’t like musicals. Sometimes the music is ok, but mixed into the story I’m often too much of a realist to suspend disbelief long enough to understand why all these characters are suddenly singing. I can count the number of musicals I like on essentially one hand and not even use most of the fingers…but Galavant somehow makes musical work. Partially (like one of the musicals I do like, Candide) it works because it knows it’s ridiculous and embraces it. It keeps the premise simple but makes the details absurd but unlike a lot of absurdist storytelling it doesn’t just behave like the dodo from Loony Tunes and sticks to its narrative. Also the songs are quite excellent and remarkably in character. They remind me of the songs from Futurama or David Brent: Life on the Road. The joke isn’t that the songs are bad, but the characters singing the songs sing them from their own perspective without snarky irony. One of my favorites is when meat-headed henchman Gareth (portrayed by tough-guy Vinnie Jones) sings the most stereotypical love song in the most literal way possible and it’s lyrics and performance are entirely in character. It’s the kind of show that can have a comedy king sing about self-esteem to a bearded dragon and make you cheer. Fourth Wall Breaks: For those who don’t know, a fourth wall break is when the characters in the show break the reality of the narrative to acknowledge they are fictional characters in a fictional world. It can be as simple as a classic wink to camera, or as blatant as mentioning production details of their show. The classic Teenage Mutant Ninja Turtles cartoon used to do it all the time to get a quick laugh (often inaccurately spouting off incorrect show titles or details). The character of Deadpool is essentially based around fourth wall breaks and I’m one of the few people in the world who can’t stand the character. I think of this kind of snark as “internet storytelling” where storytellers have the chance to do everything as a cliché then make fun of it for being a cliché…while still doing the cliché. Breaking the fourth wall is often a cheap way to get a joke. And Galavant does it and gets some cheap jokes, but it is done less for snarky cheap reasons than it is just to point out absurdity in an absurd story. It’s hard to fully explain why it works in the show to have the narrator sing of the cliffhanger, to hear a character chime in that they can’t die because there’s one more episode left, or have someone comment that it’s awfully early in the season for a main character to almost die. But it does. It works because of the production and delivery. It’s not done as a wink to camera or a “ha-ha look at us pointing this out” with the comedy pause. Essentially all of the characters are anachronistic for the supposed 13th Century vaguely European setting. And when one of them says something equally anachronistic or out-of-narrative it fits. The jokes are often also subtle and not dwelt upon. They are usually just part of the dialogue thrown in casually and quickly passed over. 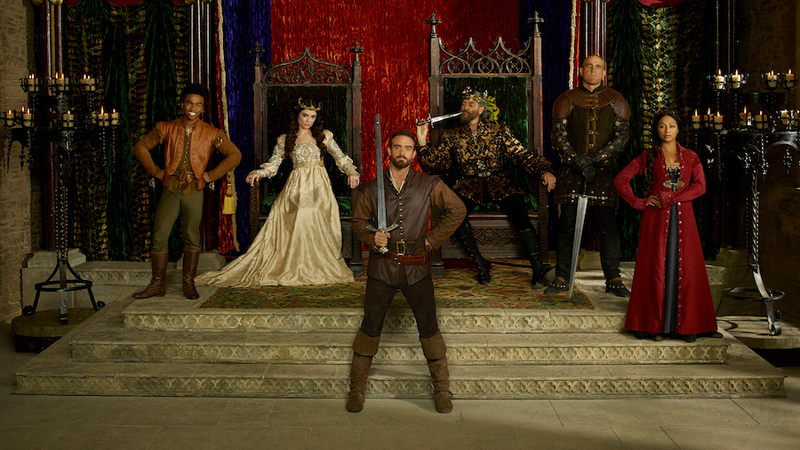 It’s the kind of narrative treatment that so many have tried and failed to do…and Galavant does so well. Network TV: When was the last time I saw something on network TV worth watching? Call it a prejudice but I can’t think of a show I tuned into on the big networks in the last decade. Most of what I watched have been cable shows or smaller network shows (Monk, Psych, Supernatural, River Monsters) and syndicated shows re-run on cable networks (Futurama, The Simpsons, etc…) To think a Network produced this show for TWO seasons is SHOCKING. They found some budget in between reality TV, contest shows, and legal dramas to make something unique, risky, and entertaining. The entire first show of the second season is dedicated to the idea that they can’t believe they’re back for a second season. If networks would take more risks to produce more content like this maybe they’d win back some of the viewers who have defected to other forms of entertainment…like me. Those are the main reasons the show shouldn’t have worked but did. The straight positives are far too numerous to list. The ENTIRE cast is brilliant. Stand outs for me are Timothy Omundson as King Richard (he is legitimately show-stealing…), Mallory Jansen as Queen Madalena (who is both hilariously evil and remarkably sympathetic…and who has joined the list of fictional characters I want to marry), and Vinnie Jones as Gareth (who somehow creates a character who is a self-described “horrible person” but isn’t “entirely evil.”) Add to that all the cameos from amazing guest stars just kind of thrown in (Weird Al AND Ricky Gervais?! Yes please) and you get one hell of a show gone far too soon. Who knows maybe it’ll gain traction from viewers like me who missed it the first time and we’ll get an even more unexpected THIRD season! Right now its episodes are 18 perfect little jewels and definitely not to be missed.